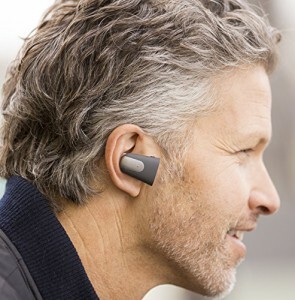 Blue tooth enabled personal amplifiers, sometimes referred to as Smart P.S.A.Ps, is where the most innovative and advanced technology in the hearing amplifier market is happening. The best feature of these devices is that they can be personalized to the users hearing by the user themselves through an app. 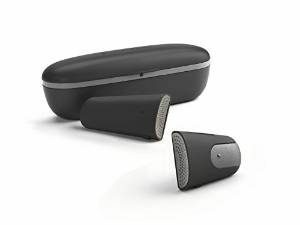 They are relatively inconspicuous because they are designed to look just like a blue tooth headset that people use to make phone calls, making these types of amplifiers a perfect choice for anyone who doesn’t want other people to know that they are wearing a hearing device. The two major players currently in this market are Sound World Solutions and Soundhawk. 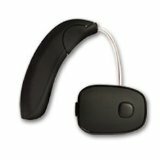 Both companies produce listening systems that use cutting edge technology similar to what is found in high-end hearing aids, but for a much lower cost. 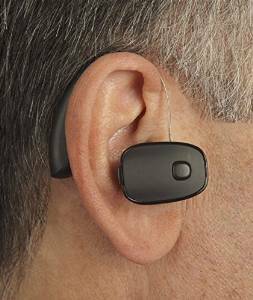 These smart P.S.A.P’s don’t look like traditional hearing aids and are not intended to replace hearing aids, but they can be beneficial in situations where users may need a hearing boost. Scoop is up to 9 hours of active listening time. Add up to 18 hours more with charging case battery. Scoop and Wireless Mic Together up to 2.5 hours. 2.5 hours more with charging case battery. Requirements To use the App you need Apple iOS 7, Android, Windows, or Mac OS X. Android or iOS smartphone or internet-connected tablet, access to a Mac or Windows-based computer with internet access to download and install firmware updates. Support laptop and desktop computers running Mac OS X 10.7 and later and Windows 7 and later.